What Is The Best Garden Rake. A Review. Hi. In this review I will be answering the following questions on Garden Rakes for you, the beginner gardener. What type of rake will I need? What makes a good Quality Garden rake? What Is The Best Garden Rake. There are actually many styles and types of rakes. Apart from the basic gardening varieties, there are also those designed to be pulled behind tractors. However, the beginner gardener, or for that matter, any gardener that owns an average suburban plot, won’t require anything beyond the usual garden styles . In this review I will describe four of the most basic rakes that are used in everyday gardening. 1. The Level Head Rake, or Common Garden Rake. This version is the most common rake used by gardeners worldwide. It is normally constructed from metal and has a long timber handle. The head of the rake consists of a straight metal frame with tines pointing downward at 90-degrees. This style of rake is often used for smoothing out soil before laying turf, or seeding grass. It is also utilized for a similar purpose when building vegetable gardens. 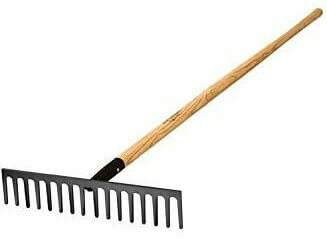 As the name suggests, this rake is normally used for removing leaves from the grass covered areas of the garden. Leaf rakes are usually constructed of a long timber handle with a flexible metal rake head. The head can be made of either metal or plastic tines positioned into a fan shape. The Tine ends are fairly long and angle slightly downwards, making it easy to collect leaves using a pulling motion. The hand rake consists of a metal head that usually has three prongs. This tool is primarily used for cultivating garden beds or vegetable plots. They are a fantastic tool for removing shallow weeds. They can come in either short or long handled versions with the handles’ normally being made of wood. The bow rake is looks very much like a hand rake and can do a similar job. 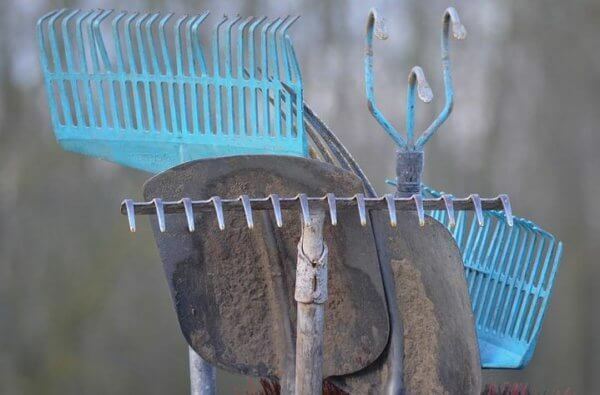 The tines on this rake are widely spaced apart along a strong metal frame. These tines are more flexible than the normal hand rake but are ideal for cultivating garden beds and vegetable gardens. The head of the rake is attached to a long wooden or metal handle and spreads outward in a bracket shape much like a leaf rake. The tines attach to the metal band and point downward towards the ground. Once again the length of the handle makes working with this implement much easier on the back. Which Rake Should I Choose. If you can afford it I’d purchase all four, they each have specific purposes that can help any gardener complete a job with total efficiency. For the beginner gardener however there are two rakes from the above list that are a must. 1) The Common Garden Rake. When you first start out in the world of gardening, you are going to need the common garden rake to level out soil for turfing or planting grass seed. Spreading of mulch and manures. Spreading gravel on paths, as well as numerous other gardening jobs. The leaf rake is an obvious choice, especially for someone that has purchased a finished garden full of shrubs and trees. This rake will help you clean up leaves off the lawn in the fall, as well as removing any grass clippings your lawn mower might have left behind. I have completed this review a little different from how it would normally be done. I believe that it’s more important to understand the different types of gardening tools that are available before we start to look at any particular brand. That’s not to say reviewing a brand type is not needed, just that it’s more difficult with these style of tools than, let’s say, lawn mowers. For this reason I will simply suggest to you the gardening rake for each variety that I personally consider the best on the market, and why. 1). Value for money. Garden rakes can cost over a hundred dollars. This Level head rake is less than $25. 2). Very strong well-built Rake. Can undertake heavy jobs easily. 3). Should last a lifetime. 4). Just the right weight, not to heavy. 5). This rake can do anything the more expensive ones can do. I often encourage people to buy quality tools. This is a quality rake at a cheaper price. Sungmor Antirust Aluminium 48 to 61 inch Telescopic Leaf Rakes with 15-Teeth Adjustable Folding Head, Worth Garden Long handled Leaves Sweeping Tool. 1). This is a fantastic lightweight rake. 2). Made of Aluminium so won’t rust. 4). Excellent Locking system on Tines and handle. 5). Great Value for the price.. Under $30. I have always used leaf rakes that were made of plastic and had wooden handles’. I’ll never go back to them after this fantastic rake came along. So now you know should be able to make some wise decisions on which of these fabulous rakes would suit you best. As I stated earlier, for the beginner gardener I would simply choose the ‘level head or common garden’ rake and the leaf rake. If your finances are okay, than go for all for. You will get to use them all eventually. Please feel free to make any comments you might like in the box provided below. Should you want me to review a certain product, or you may want to know more about any of the rakes above, just ask. Hi Jim. I had no idea that there are so many types of rake available. But it actually makes sense to have specific rakes for each job. Thanks for the information. I know know what to look for when purchasing my next set of garden tools. Interesting article. I love it when I can read something and actually learn something from it. I’m happy I came across your post, we just bought a house with a huge garden, which needs big maintenance,so a rake is very welcome. I didn’t knew there were that much rakes available, but the common rake is the best for us. Do you have any idea which kind of tool I can use when it comes to cleaning weed from my growing plants? I use the Common Garden Rake all the time. Believe it or not I never use it for what it was made for too. I own a chrome plating shop. Sometimes parts fall to the bottom of one of my tanks and the only way to get them out quickly is with the garden rake. If I cannot get it that way I have to pump out the tank, which takes a lot of time and work. I love using this rake. Makes my job so much easier at the shop. Growing up I used it a lot with a hoe to help with the family vegetable garden. I also have used the leaf rake a lot too, but that was for what it was made for lol. I am a pro with that lol. Thanks for giving nice, clear information on the different types of rakes. I knew leaf rakes were for leaves, but the others I was never certain of their purpose. I tend to have a black thumb and maybe this is part of the reason why, heh. I’ll be checking out the rest of your blog to see what else I can learn. Thanks again! I had two garden areas before I moved. One was in my backyard and the other was behind my perimeter fence just before some thicket. Once I made sure there were no tree or bush roots within the proximity I would start my planning. I like taking a shovel and rake and beginning the landscape process. I had a decent shovel and common garden rake back then. I don’t no what happen to them. 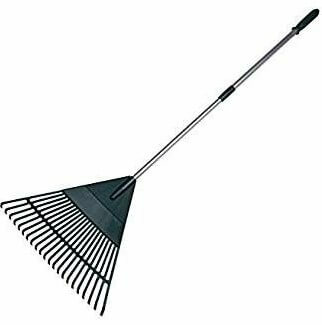 I must say that there also some cool things about using a hand rake. To get in the plants on your hands and knees connecting with the soil of the earth To feel the temperature of the ground at the same time yanking out a weed. I miss my gardens. It was a relaxing hobby for sure.